In Infection: Humanity’s Last Gasp (Victory Point Games) by John Gibson, the player is a scientist in a CDC-type lab, trying to deal with the latest outbreak of a deadly virus. By harvesting Proteins that are spawned every turn, they are attempting to replicate the structure of the Molecules that make up the virus. They can purchase and then use various Lab Equipment cards and Scientists, which will confer different bonuses or allow them to break the rules in various ways. But be careful! Not only does the Virus mutate at the start of every turn, but there is a growing death toll out there and if it becomes too much, game over, humanity has lost. The components are of the usual Victory Point Games quality: the one “sheet” of token (really, a sheet of particle board that was laser cut) was cleanly cut, with just a light dusting of ashes around them, which was taken care easily with a paper towel. I just love the thickness of the tiles, and they have the best registration, with the cut line being perfectly aligned with the edge of the piece. They kept the shape of the tokens relatively simple, making them very easy to punch out. Good work here. The tokens break down into 3 groups: square Proteins; round Molecules; hexagonal Special Power tokens; and Information tokens (Money and Death tokens). The game also comes with two decks of cards: an Event deck and an Lab Equipment/Personnel deck. The quality of the cards is again the usual: nice and well laid out, but the cardstock is a little too flimsy. If you’re planning on playing this game a lot, you might want to sleeve the cards. They are certainly more than serviceable, but they will probably not stand to repeated shuffling. 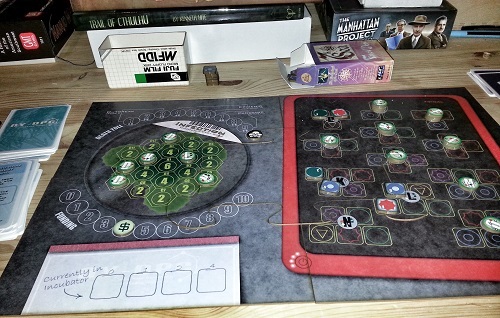 Also included is two game boards: one printed on heavy cardboard and one printed on a thinner version of the same type of particle-board as the counter. The particle-board board is puzzle cut and lays perfectly flat. Both boards are identical and come in the standard box, so it’s really up to the player to decide which board they prefer to use. I like the puzzle-cut board, but mileage may vary. 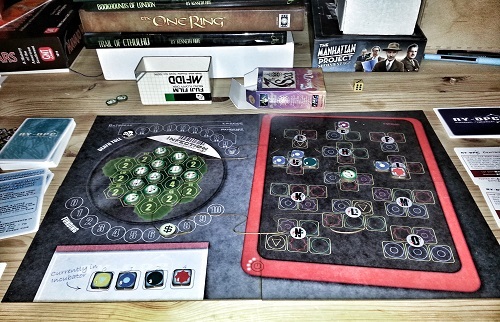 The board is double-sided, with one side being the “easier” difficulty level (Bacterial level) and the other the “hard” level (Viral level). I’ll explain the difficulty level later on. The rules are very clearly written and well organized. I very rarely looked for a rule or clarification for more than a few seconds as I was able to find everything I was looking for quickly. 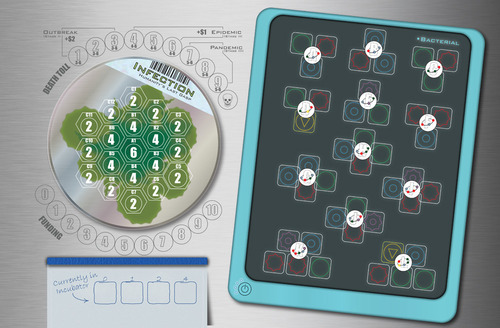 Set up for Infection is fairly straightforward: choose the difficulty level of the game by picking either the Bacterial or the Viral side of the board; shuffle the Status Report cards and place them beside the board; place the Death token on the 1 space of the Death track and Funding at $15; shuffle and remove 5 cards from the Lab Equipment/Personnel deck and place the rest besides the board, drawing 3 cards to seed to initial purchase track; prepare the Molecules by removing the correct Molecules for the difficulty level, draw 6 to seed the petri dish and add 2 random positive and 2 random negative token to the Molecule blind draw cup; randomly draw the 4 initial Proteins and you’re ready to go. 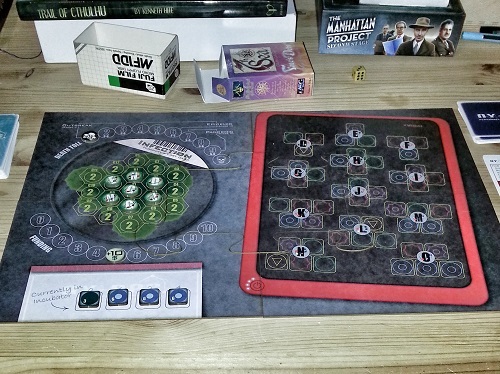 Infection – Game setup, hard side up. The Status report phase, in which the top card of the Status deck is turned over. This will indicate how the Virus mutates by either bringing in new Molecules to the Petri dish or switching some of the Molecules that are already on board with new ones. This card will also indicate whether the Lab Equipment/Personnel are working correctly/giving a bonus and how to handle the end of the turn Death check. Player action phase, in which the player can purchase Lab Equipment/Personnel cards, purchase 2 Proteins to add to an Antibody, remove Molecules if they have the correct Antibody, or use Equipment or Personnel cards. The player can do as many actions as they want, as long as they can afford them. 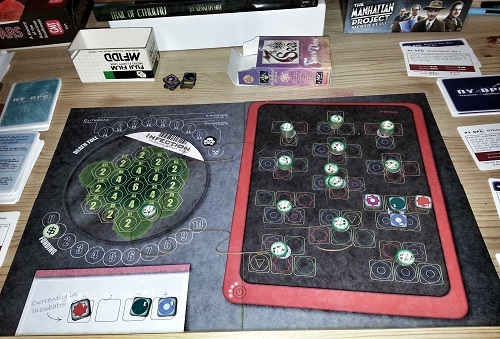 Containment phase, in which the player checks, by rolling a dice against the target number on the Death Track, if the contagion has spread. If it fails, the Death marker moves up on the track. Reach the end and it’s game over, for the player and humanity. Clean up phase, in which the player re-seed the Protein track, adds a new card to the Lab Equipment/Personnel tableau if a card was bought or replace one of the cards if none were bought. If he hasn’t lost or won, a new turn is started. The game will end if: time runs out and the Death token has reached the end of the track; there is no more Proteins to be drawn during the Clean up phase; all the Molecules have been removed from the Petri dish; or the Funding track is at 0. The core gameplay is putting together the different Molecules to form Antibodies to destroy the Molecules . This is a simple process: the player selects one of the Proteins in the Incubator (the 4-space area beneath the Petri dish), pays the cost (0, 1, 2, or $4) and places it on a Molecule that hasn’t been eradicated in the Vaccine area (the large area on the right). Once all the spaces on a Molecule have been filled, the player can start removing the corresponding Molecule in the Petri dish, as long as at least 3 sides of that Molecule are free. If the Antibody was made this turn, the player takes funding corresponding to the number under the Molecule that was just removed. Should the player remove several of the same Molecule in a row, they get the total amount as funding. This is where a lot of the strategy comes in: you want to make sure that the Molecule you’re working on is nice and open and, if possible, that there are multiple copies of this Molecule so that you can score as much funding as possible. It is possible to remove Molecule in subsequent turns, you just won’t get additional funding for removing them but you’ll at least get closer to winning. Infection – oops… Almost… just a little more and we should be able to stop this infection. Lab Equipment and Lab Personnel cards are cards that allow the player to bend the rules a little. Equipment cards’ effects range from allowing the player to change all the Proteins in the Incubator, to duplicating a Protein when it is placed on a Molecule that has two of that Protein, etc. Such effects come at a cost however: unless the player has two copies of the Lab Equipment card (which can be quite pricey), they must roll to see if the equipment works. Similarly, Lab Personnel gives the player one shot effects that will allow die roll modifier when checking for Contamination at the end of the turn. make sure that the Equipment card works, etc. Both types of cards can be quite useful, but unless you’re playing at the easy difficulty level, be careful in purchasing them since funding is very tight. It is easy to spend too much on these cards only to find yourself with no funding to purchase the Proteins needed. There are also some rules to increase your challenge if you don’t find the Viral side difficult enough, with two variations having to do with funding (start with $10 instead of $15 and pay $1 every time you attempt to use an Equipment card) and the last one being frankly a little masochistic (you need to re-create the Molecule every time you attempt to remove one after the turn you first created it. At least, you get funding every time as well). Nothing earth-shattering, but nice little tweaks that are easily done/remembered. I enjoyed my time with Infection. The complexity of the rules was low enough that by the end of the first game, at the Bacterial level, I felt that I knew all the rules and no longer needed to refer to the rulebook during play. Since the game is short enough (roughly 30mins), it’s easy enough to reset the board and go for another one right away. Chances are very strong that you will beat Bacterial in your first or second play through and you will most definitively need to switch up to Viral level in order to get a challenge. The biggest differences between the two levels are twofold: 1) you don’t get any money at the end of the turn, which makes purchasing Equipment or Personnel a much tougher choice; 2) there are less easy, 3-Protein Molecules and more 5-Protein Molecules. This isn’t as impactful a change as the money since there are only 1 of each new Molecules, meaning they shouldn’t be difficult to ignore them until you’ve got the 3 and 4-Protein Molecules all but wiped out. The tightness of money on the other hand means that you will probably only get to hire one Scientist at best, since it will use up most of your budget when you do so. Infection – ooops. There goes humanity. My biggest pet peeve in solitaire games is that usually your opponent is replaced by simple luck, making the game an exercise in luck instead of letting the player devise a strategy. This is a problem seen in the earlier State of Siege series, where the player quickly feels like all they are doing is rolling dice and being unable to take a meaningful decision beyond which front to deal with since there are no modifiers that he can bring to the dice roll. There is some luck present in this game, but the player definitively has to come up with a strategy as to how to deal with the outbreak. Sure, the strategy should be fairly obvious (go for the low hanging fruits first, then go for the larger Molecules) but still, the player is in control of the timing to a large degree and this timing is what can make the difference between success and failure. Sure, the clock is ticking but your number 1 job is in when to pull the trigger and create that first Molecule. Timed correctly, you can net $8 or $10 in funding, which will go a long way to insure you have a chance in winning. There’s an odd thing that happens in Viral difficulty and which helps the player greatly, especially those who deal with the smaller Molecules first: it will be more than likely that within the first 15 or so turn, you will run out of Molecules to put in. The moment this happens, the Virus is a hell of a lot more stable and the game becomes much easier since now all that matters is that the right Proteins come out cheaply. Suddenly, you have one less ball to juggle. This doesn’t happen as fast in the Bacterial version because there are more Molecules , albeit of the 3-Protein type. Something to keep in mind. Infection – Cure: found! Now on to the common cold! I feel that there might have been a missed opportunity in the way the virus mutates, allowing for the player to have some strategy in which Molecule to remove first, but it might have made the game a little too complex for what it is. As it is, the virus grows in a very random way, which may or may not reflect reality. All in all, it is an excellent little filler, with a good amount of strategy needed by the player to insure success. It will probably hit my table from time to time, although it’ll have to fight Swing States 2012 for that short, solitaire play experience slot. I’m glad you enjoyed my little solitaire game, Stephane. I agree, this is a great solo game. Definitely one of my favorites to put in time. Great to meet you at Stack Academie last weekend. Looking forward to reading your other articles. My board game Infection will be becoming an app. Victory Point Games is teaming up with Hunted Cow Studios to develop and publish digital versions of some of VPG’s most popular titles, including Infection. Check out the Victory Point Games website for the press release.